This beautiful 2nd row beach house has magnificent views of both the ocean and the sound, which can be viewed from all four decks. 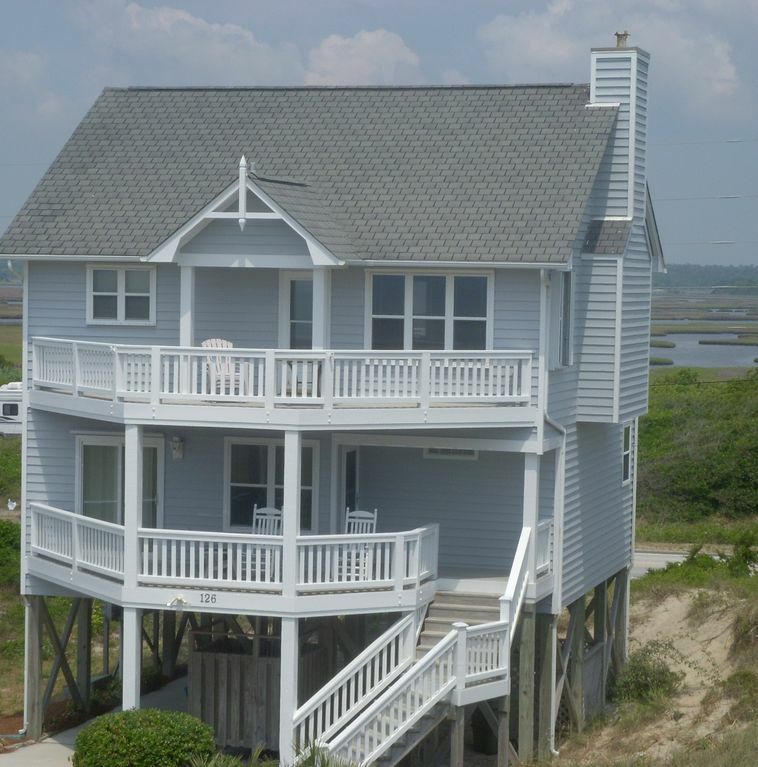 It is located in Topsail Island's premier beach development, Village of Stump Sound. In addition to enjoying the ocean, the community offers a swimming pool and tennis. Brand new beautiful flooring installed throughout entire house in June 2017. The house has WiFi and cable TV. The fully equipped kitchen is open to the living and dining areas. Enjoy amazing ocean and sounds views from all areas of the upper level of this reverse floor plan house. The house comfortably accommodates families of up to six people. The master bedroom and one additional bedroom each have a queen size bed, TV and DVD player. The third bedroom has two twin beds. The beach, just 100 yards away, is NEVER crowded, even during summer months. Parents and children will love the quiet cul-de-sac setting. Kids can access beach and pool without crossing busy roads! Dock for fishing, crabbing, and launching small boats is located in the community. Marina for large boats is nearby. Topsail Island is a fisherman's dream! Highly-rated golf courses are nearby. Golf can be played year round. Spring, summer, and fall are beautiful. Many restaurants as well as grocery stores and a variety of shops are located nearby. We rent our beach house to families only. Minimum age to rent is 28. Weekly rentals only. Turnover day is Saturday. No smoking. No pets. We had a fun and relaxing week on Topsail Island. Michelle was excellent to work with before and during our stay. The house, located on a cul-de-sac in a quiet, quaint neighborhood, was comfortable and well equipped. The beach was so close - located across the cul-de-sac, down a short path and up the walkway over the dune. It was not crowded, full of shells, and the water was warm. While we were initially suprised to learn there were no lifeguards on duty, it felt very safe otherwise and we didn’t hesitate to leave our things on the beach to go back and forth to the house. Conveniently, the house has an outdoor shower, hose, and enclosed area to store beach equipment. We had beaitiful views of the Atlantic Ocean and the Intracoastal Water Way from the main floor of the house. There is also a community pool in the neighborhood. The island is full of adventure. Our family explored local shops and restaurants, went fishing and crabbing, rode jet skis, and took a relaxing and informative two-hour boat ride down the waterway. As an added bonus, we were only a short drive from Wilmington which offered even more shopping, activities and restaurants. Lovely beach house! Everything was as described. We were traveling with my daughter and her family (including a 3 1/2 year old), and we took advantage of the many decks/porches to both enjoy the views (saw dolphins one morning!) and not be on top of each other all the time. The owner responds quickly to inquiries, and was very helpful. Topsail Island is uncrowded and laid-back; we especially enjoyed the beach, kayaking in Stump Sound, getting fresh seafood to cook and take home from Surf City Crab, the Corner Sweet Bake Shop (peach cronuts, wow), the Karen Beasley Turtle Hospital, the Tuesday Farmers Market (with crafts), Shipwreck Mini-Golf and the educational program run by the environmental aquarium, which had children and adults seining in the surf with a naturalist who explained the "treasures" we found. . . .
My family had a blast! This is a beautiful home, very clean and spacious. Everything we needed was there. The large decks allowed us to enjoy a view of the ocean, whether eating a meal, reading a book, or watching the dolphins. The beach access was directly across the small cul-de-sac street. Plenty of restaurants and shopping close by. The owners were amazing and very helpful with directions and ideas of what to do. This house was perfect for our family. Very relaxing ... a wonderful way to spend our Spring Break. I would highly recommend it, and would definitely return! Thank you! First trip to Topsail and we absolutely loved it! The house was roomy and well equipped. Access to beach just steps away and not at all busy or crowded. I was very pleased with the owner as she was very quick to respond to my inquiry, questions, and emails. I would highly recommend this rental! Wonderful upstairs! Very open, spacious living room & kitchen w/ lots of windows, decent ocean view & beautiful sound/marsh views. Tons of space to cook & eat-in. The house was very clean & well equipped. We only had two uninvited guests during the week (water bugs) which is GREAT for the NC beaches!! We did have to air out the house upon arrival due to a slightly unpleasant/stagnant odor. We could never figure out if it was from pesticide spray or just an older-home-being-closed-up smell. We opened the windows & got a great cross breeze so all was well in a couple hours. The Jack-and-Jill bathroom wasn't ideal for our group, but would be great for others. The extra half bath upstairs was a wonderful addition! A screen door on the front bedroom would be a nice addition, but that's just three women being picky! The pool is wonderful & not a bad walk away. However, those with kids should know that they are very strict on items you can take into the pool, food, etc. Not a bad policy, just FYI. Walking down another driveway to beach access felt a bit odd, but was not a problem. Overall, a nice house, nice location & a very nice visit. I am glad to hear that you enjoyed your stay! I apologize about the slight smell. We had the carpets cleaned the week before your arrival. Since the house was vacant that week, the shampoo smell apparently lingered. Please be assured that we never use any pesticides inside the house. We only have the outside treated quarterly - a necessity at the beach. For reference, our house was built in 2000. Thanks for taking the time to write a review. We appreciate it! Families only. Minimum age to rent = 28 No smoking. No pets.